I shamelessly am very proud of my hall of prune blossoms. Here are my bricks, 10kg of 2006 Lao Ban Zhang pu. The excitement I feel about these bricks is similar to an opium addict found a supply of the gooey paste in bricks on the opium bed. Speaking of opium, tea and opium got mingled together starting late 1700's, the British forced opium import to China to pay for tea consumption instead of paying with silver, triggered the famous Opium War in mid to late 1800's. The lost of Hongkong, forced open trading in ports of Guangzhou, Xiamen, Ningbo and Shanghai, the nation was brutalized by the British and other European countries, lingering resentment of the western countries are still among many Asian countries in addition to China. It was the most difficult time in all China history. Tea has been a luxury item highly sought after and fought for for hundreds years. I can't imagine not indulging every sip of tea I can get my hands on. I treasure my tea more than diamonds and gold! Tea can nourish your soul, enrich your spirit, cleanse your flesh. Beauty within is the ultimate endeavor. My blog is targeted by a handful of spam online promoters recently, featuring adult contents and various commercial products. 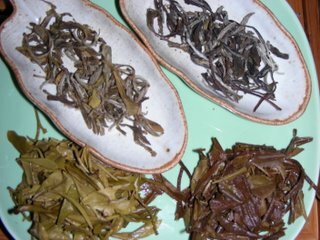 To prevent further spamming and maintain the "purity" of my tea, I have changed comment setting of this blog to registered users only with text verification. I apologize for the inconvenience and thank you for your understanding! Part of my loose leaves order arrived over the weekend. 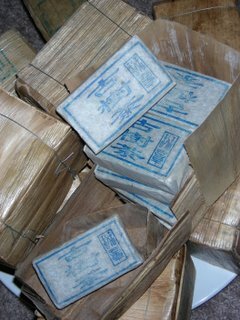 Inside of this box are mao fung, silver needle, sun dried bai mu dan, traditional bai mu dan and 10 kg of Lao Ban Zhang. This is my favorite out of the 4 greens. Although I am not a big fan of green, this Bai Mu Dan has the floral aroma of a dan cong, sweetness of a pu-erh and the lightness of a green without the bitterness and grassiness. It started with a strong sweet floral aroma, liquid is clear yellow, sweet, a lot of flavor for a green. Being sun dried, it should be categorized as white instead of green?! Well, it has all the characteristics of white, no much of green at all. It can take long steeping and hot or warm water, taste great hot or warm. The flavor does not turn bland in anyway. It's a great tea for beginners and every day office drink. You can't make a bad cuppa with this tea no matter what tool you use. Well with the exception of bad tap water maybe. Love it! A good skilless tea. Attractive looking leaves, young and hairy, though not as hairy as some others I have seen. It's also on the thin side. It was nutty and grassy, astringent, very light yellowish color, sweet after taste, dry mouth feel afterwards, can't take long infusions. It's decent, but nothing to brag about. 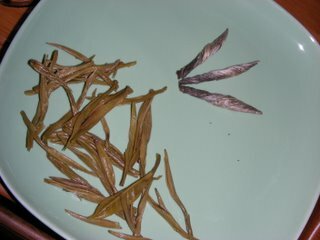 interesting looking tea, my first perception was these might be some old leaves. Turns out they are very young and tender, long thin leaves picked right after spring rain. Sweet and nutty, a bit astringent, slight sweetness, last 3 brews, faded quickly after the second. Its flavor is better than the silver needles. I had 3 out of 4 greens so far for the day, and already drunk. 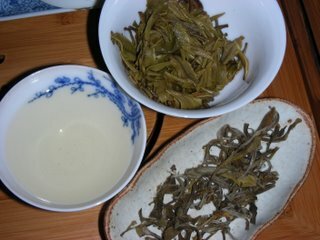 But, I am going to hit one more - traditional bai mu dan. This is a true green version, steamed then dried. Light floral, grassy, hint of nutty and astringency, sweet and nutty after taste, last 3 brews, mild in every way as a typical green. Bitter and astringent when steeped for long. 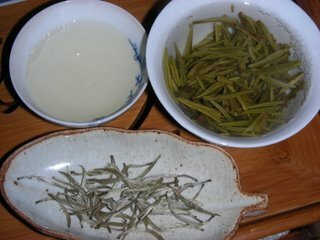 Left: traditional (steamed green); right: sun dried (fermented during drying). Sun dried version is very flavorful compared to the steamed version. The fermentation allowed the break down of the sugar, gave it a honey like sweetness brew after brew. This is my re-orderable item. Wu Yi Shan has long been the major tea producing region through out China history and today. 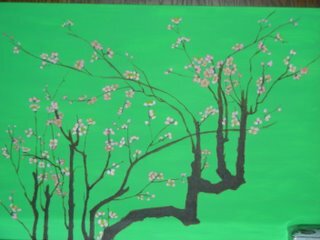 Gong Bing - Tea cakes were produced before the Ming dynasty, loose leaves thereafter. Before tea became a fashion in European, black tea was no where to be found. It was born due to an accident. A military troop past by a village, made themselves comfortable by sleeping on top of a layer of tea leaves which were being sun dried during the day. The village people couldn't collect the leaves over night, then found the fresh leaves completely fermented the next morning. 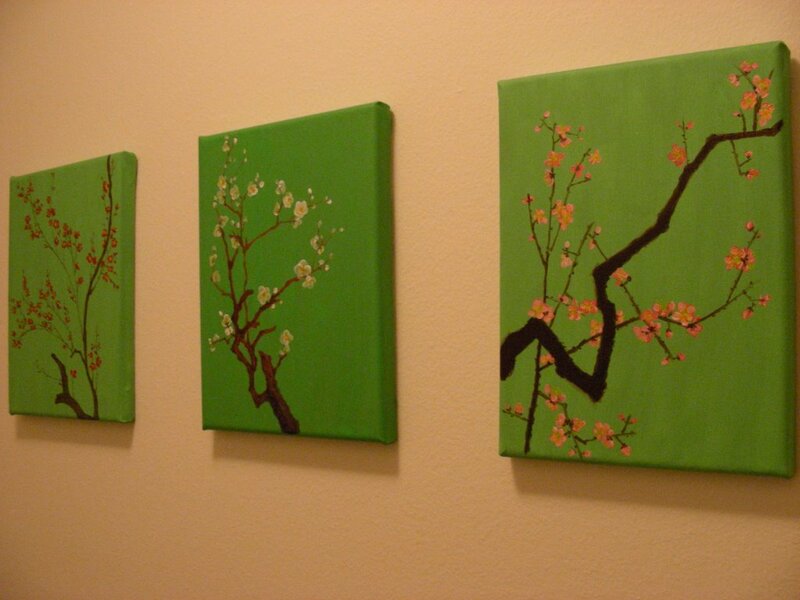 These leaves were to shipped to Europe originally as Wu Yi Yen Cha. But as a result, the village people smoked these over fermented leaves to mask the flavor using fire wood. The name Lapsang Souchong was given to this new product. Interestingly enough, the Dutch loved the smoky flavor and ordered more, hence the spread of Lapsang Souchong in Europe. 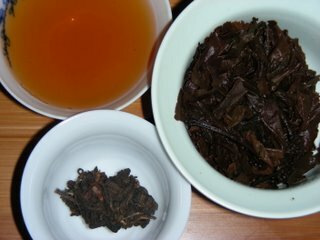 Lapsang Souchong is Fukkienese, Fu Jian in modern day. Tea is also Fukkienese, De' is how it's pronounced. It became Tee in Dutch, then Tea in English. 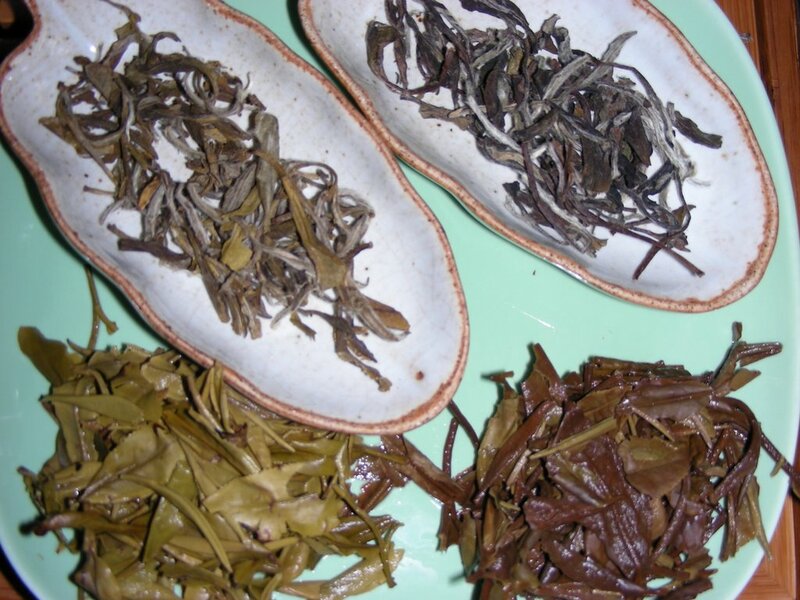 Cha is the official name in China, also used in India and the rest of Asian countries. Geographically, Fu Jian port was the first landing of the Dutch to load up ship loads of tea. De' was therefore adopted by the Dutch and carried back to Europe. In fact, most imported tea from China to Europe are of Fukkienese names. I couldn't make sense of Lapsang Souchong before I found it on an English/Chinese tag at WHF years ago. 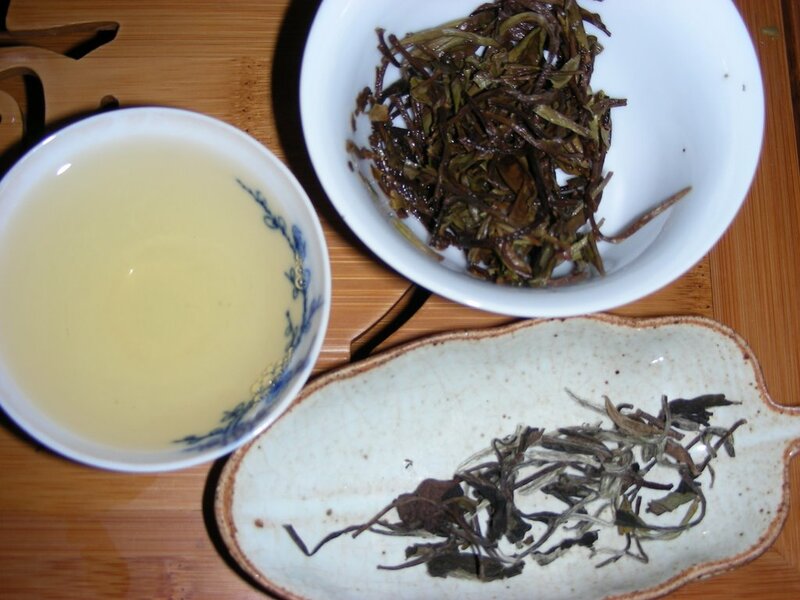 I am drinking a 1996 Zhong Cha "orange in orange" uncooked pu-erh by MengHai, sample from Hou De. Dry leaves smell nice, aged forest floor, mixture of dried leave and wood, no smoke or unpleasant smell. Medium compression, complete dehydration made it easy to break off leaf by leaf, shiny and white hair leaf tips can be found. Rinse, pour immediately, I usually taste the first rinse to see how drinkable it is. I was expecting something fermented astringent or even musty taste, to my surprise, it taste sweet and nutty right from the beginning. 1st brew, 10s, reddish amber color, clear, smooth creamy mouth feel, sweet, nutty, woody, hint of bitter after taste. 3rd brew, 5s, color remain dark reddish amber even with shorter infusion, similar to 2nd brew but sweeter mixed with same level of bitterness. I made 15 brews, each gets sweeter, but lighter in color, more floral and nutty, woodiness is almost gone since 8th brew. Open leaves, mixed regions, some young meaty leaves, some matured meaty leaves, small amount of thin large leaves do not seem to come from the same type of tree as the meatier type. Over all a well aged raw pu. New recent painting up sized from 9x12" to 20x30". I feel the pressure of my over ambitious project 36x6'.